After the successful launch of Make It Your Business’s first event of 2018 this week, our very own Fiona Grayson, Founder of She can. She did. joined the ever-inspiring Alice Wingfield Digby – one of our esteemed panellists and Founder of Wingfield Digby – at her stunning South-West London home last month. She can. She did. I have serious house envy right now! Right, shall we start with what your business is all about? Alice Wingfield Digby. Ok! So everything at Wingfield Digby is inspired by the Great British countryside and at its core, it all began with feathers because for me it was such an under tapped resource! We often do a lot of game and had so many lovely feathers lying around and before I started doing this, I’d never seen products that are beautifully made with feathers incorporated that are designed to last. So that was the brief – homewares and accessories inspired by the great British countryside and many incorporating real feathers into the luxury designs! It very much started at the kitchen table, playing around with different glues and all the rest of it and eventually I found a way to make it work and people liked it! Everyone loves feathers, there’s something so majestic about them. SC.SD. So true! I have such a vivid memory of finding peacock feathers at Whipsnade Zoo when I was little and being so happy! AWD. That’s exactly it! It was a case of encapsulating that excitement into something that will last. That’s the main range but we’ve had a few offshoots- mainly my husband’s ideas! He wanted to wear his feather cufflinks at work and he thought actually, we could probably do a good job designing pheasant ties and belts to compliment the feather cufflinks… so at the heart, it’s a love for countryside but particularly feathers! Having grown up in the Hertfordshire countryside, down the road from George Bernard Shaw’s house, Alice’s love for the country has been ingrained in her since she was born. 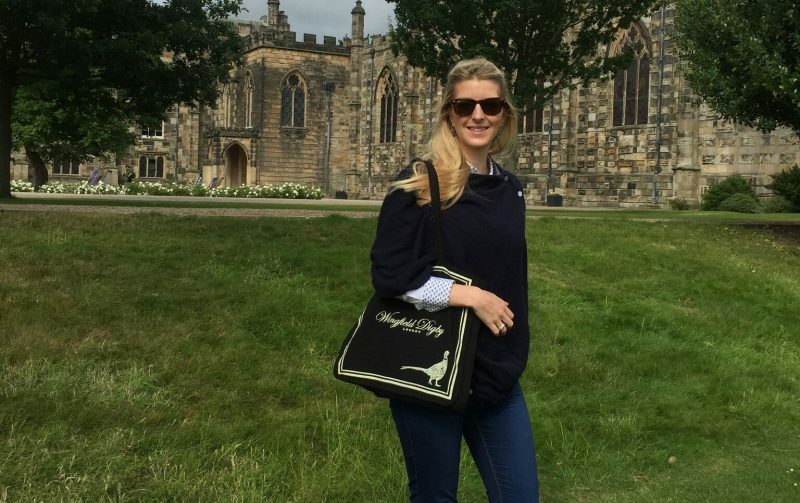 Yet whilst she had always dreamed of owning her own business as a child, having gone on to study chemistry at Edinburgh University, owning a luxury homewares and accessories company inspired by nature wasn’t exactly the obvious choice from the outset. AWD. I’ve always taken my own route I suppose! Chemistry was weirdly one of my best subjects! I’m dyslexic so I think that visual numbers worked better than the wordy subjects for me. I loved it at school and it was probably one of the few courses I could’ve got into at Edinburgh with my grades because they were so short of women studying science! But when I got there it was very much more physics. The minute I lose interest it’s very difficult for me to learn! AWD. Flyering was a massive thing back then for the thousands of club nights. They’d be treaded all over the pavement but ultimately you go where your friends are going and the flyers are a waste of time! SC.SD. You said we… who’s we? SC.SD. It gave you a little taster? AWD. Exactly and that was fab! It’s really sad though because I do think had I had the courage to drop out of uni, it could have been massive and we could be sat here today talking about a whole other business! That’s when I realised I had a passion for marketing though. SC.SD. It’s so strange how life works out isn’t it! AWD. I know! In general though, I do think that people that work hard and are determined will make it. SC.SD. Absolutely. Did you have any idea when you graduated that you’d end up with your own business after uni? AWD. Yes! During maternity leave I was on my phone every day which is fine I guess because it stopped me from getting complete baby brain but there were days where I was exhausted! I just thought ‘there can’t be a worse maternity package than the one I’m on right now’ but I’m so lucky because Mum helps with my daughter! When I come home exhausted some days, she just says “go to bed” in a way that no one else could say to me! I went back to work after about four and a half months and I thought ‘oh I’ll be able to work from home three days a week’ but it’s very much four very full on days in the office and then working from home on the other days! But you know, I love what I do! AWD. Well I quickly realised at uni that I was never going to be the brain that found the cure for cancer! After accepting that her applications to grad schemes were not going to be successful – the recession had just hit so securing one was like “gold dust” – Alice got a job at an online marketing company; first as the EA to the Director and later in the marketing department. However, focused more on Google ad words and SEO and limited to playing around with roughly twenty words, the job wasn’t half as creative as Alice had hoped. Unfulfilled at work therefore, she found the time and drive to focus on launching Wingfield Digby. AWD. I was kind of coasting there. I was taking all my holiday to go to shows and events with WD and just waiting for the right moment to jump ship! AWD. Where to begin?! So sourcing the feathers was easy because our family had a lot of game! In terms of the design though, because I wasn’t trying to reinvent the wheel so to speak, I was just trying to source really good looking photo frames that worked with feathers, initially it was just adapting products that I admired to see if they allowed me to incorporate feathers. For instance, I started finding and playing around with photo insert products because they obviously have that little window but it’s so labour intensive! SC.SD. And you do all of that by hand? AWD. Not all myself anymore but yes I did initially! That’s why I couldn’t charge too little for the products because of the hours that went into them. That was good in a way though because it set us apart from the outset as a luxury brand. SC.SD. I’m honestly clueless. I look at some of the images on mine and I’m like whoops, it’s cut her head off… I’ll come back to that! AWD. Exactly! It’s a work in progress! We’ve had 3 or 4 websites now – none of which we’ve spent much money on – but every time they get a little bit better. Back then everything had to fit into Harry’s Golf so we had to have two collapsible six foot tables in the boot and all the kit in the back. If it didn’t fit in the car it couldn’t come because we didn’t have the margin to be hiring vans! We were also living in a third floor flat at that point so we had to carry all the stock up and down the stairs. Invariably, you could never park outside the flat as well so you had to carry it half way down the road too! I mean, the amount of pressure that put on us as a couple at certain times was mad but we came out the other side! Every year we say we’re working really hard now but we have no idea how we did it back then… Taking holidays to do all that heavy lifting! 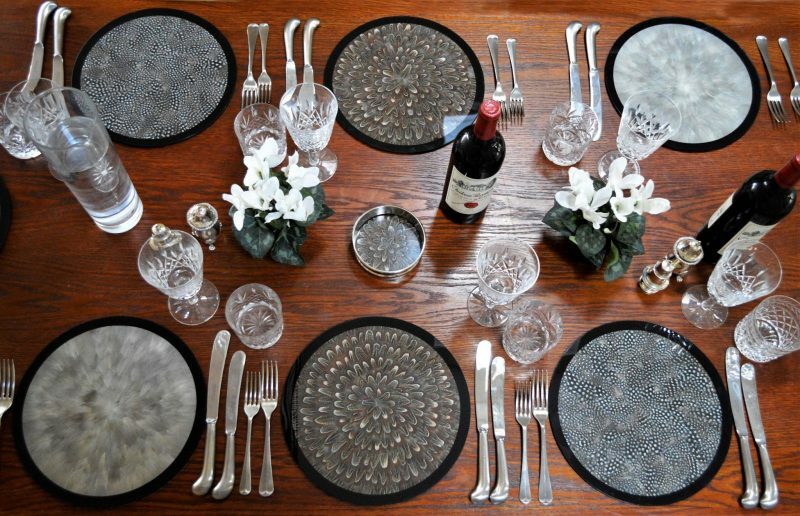 Anyway our first big sale was to a family in Yorkshire for 20 partridge placemats. The only way to fulfil that order – bearing in mind I had a day job – was to make the mats all day and all night. Harry was going up north for a weekend so he volunteered to drop them off but he managed to crash the car on the way! Honestly the whole thing was a complete train wreck but the placemats got there- the family drove twenty minutes to meet him at his crashed car to get them! SC.SD. Do you think you’re naturally quite laid back? AWD. I’m super laid back. If one of my lines wasn’t being made the way I wanted I’d be super frustrated as I know it could be done better but as business as a whole goes, if I was super uptight about everything I would never sleep. There’s always going to be someone who’s unhappy with something but I’ve got to a point now where I only need to know about it if it’s become a huge problem. Ultimately, keep the customer’s happy. If we end up a little out of pocket, that’s fine. If we end up a lot out of pocket, maybe run it past me first! We get very few returns and generally, we have really supportive customers who love what we do. SC.SD. What made you realise you were ready? AWD. It’s really hard. I think ultimately quite a lot of it came down to not feeling inspired at work. I wasn’t happy with how they handled things and you know how it is, you have a dissatisfaction for where you are and think do you know what, let’s give it a go for a while… I’ll treat it like a career break and if it doesn’t work I’ll find another job. I just felt no pressure and actually having more time to focus on it meant it worked and I’ve never looked back! Without that level of dissatisfaction – I don’t even think they wanted me in the end – but ultimately that was the final push I needed! SC.SD. Job dissatisfaction and office politics can be good like that! Alice worked on her own at the kitchen table for two and a half years before taking on her first member of staff in 2015. AWD. Escape the City. I was looking for someone that wanted to start their own business and was willing to help me and see what it’s all about. She was basically doing everything! She was called Alice as well! Still to this day, half of my team are called Alice! AWD. Yes, it’s crazy! I need to put on my next application ‘please can you not be called Alice’ because it’s so confusing! SC.SD. Did you pay her? AWD. Yes but definitely a cut from what she was on before. She started in September so she did the really busy Christmas time with me and I think that was an eye opener for her about how tough retail can be. She was so glamorous so people did double takes as she climbed out the big white van! Anyway by January she said “I’m really enjoying it but if you want me to stay I’ll need a bit more money” and by that point I just thought I can’t live without her so made it happen and she stayed for a year! She left her old job because it was so full on and I think she thought having her own business would be more relaxed but this was such a manual job, she was getting ill a lot and ultimately she decided it wasn’t the right thing for her. SC.SD. How did it feel when she left? AWD. We were close and so even though I didn’t want her to go at all, it was the right thing for her. I had just found out I was pregnant though – I hadn’t told her yet – so it was even more stressful! I remember telling my family and my older brother was like “you’re joking! A baby? Of course she’s not having a baby! Who’s going to run your business? !”  and I was like “no no, we’re genuinely having a baby! It’ll be fine, it’ll be fine! I’ll have to find some staff…!” and then I found Annabel who’s my now COO. She’s such a high flyer; I still don’t know what she’s doing with us but she’s so great! She’s the yin to my yang. We’ll go to meetings together and Annabel is so direct, she’s very commercial whereas when it comes to putting myself forward, it’s hard because I feel a) vulnerable but b) embarrassed because it feels a bit arrogant at times. AWD. Exactly! She steered the ship while I had Scarlett! I literally was doing my tax return the day before I went into labour back in May and she did everything until I was back in September; which worked out quite nicely as I was back for the busy bit. SC.SD. Do you pay the interns? AWD. Yep, they’re all paid! So at the moment, there are 8 of us and we’re really, really close! I’ve learned that when you find someone great, you just need to find a way to keep them. SC.SD. Good advice! How do you find managing a team because I’m guessing you never had that experience in your old job? AWD. No it’s so weird, I was the junior! I love it but it is definitely the most challenging element. I’ve had zero management experience but I’ve worked with people that say “I’ve got loads of management experience” and yet they’re the ones upsetting everyone! I think I can really feel if something’s not right and therefore I pre-empt things before they happen. We’re a start-up with a small team, all of my girls could walk into a better paid job for an established company if they wanted too and that’s the reality of it. But what can I offer them? Flexibility, exposure to things that they wouldn’t be allowed to do at a bigger company and working for someone that looks after them! I give them birthday presents and Christmas presents and we have a spa day for our office party with facials and massages! It’s swings and roundabouts. I’ve said to all of the girls, when the time comes and they want to go, I’ll be totally supportive. Jobs necessarily aren’t for life so you’ve got to be realistic, I’ll look after them and I just hope they want to look after me too in return! As well as her official team at Wingfield Digby, Alice’s Mum and Dad also play their part! Anyway, Mum’s obviously at home looking after Scarlett this year and of course the girls wouldn’t dare say he’s done anything wrong so I’ve had to keep quite a close eye on him! SC.SD. That’s so sweet that he helps though! AWD. Oh yes! It keeps them out of mischief and from my point of view, having people that are 100% in your camp is amazing! SC.SD. Absolutely! It’s obviously a luxury range so how would you summarise your customer demographic? AWD. Word of mouth is huge and part of that is because we sell to the right kind of shops that sell to the right kind of houses and if people give them as gifts, that touches two different houses. We only got into Instagram about a year ago so we have about 1500 followers – I’d like to think we have at least 3000 but we don’t! Anyway what’s interesting is that people come up to me because of Instagram and say “ooo I can see business is going really well, you’ve really made it now!” and I’m thinking it is going really well but Instagram is 1% of the reality! The reality is if you came into the office with me now, there are boxes everywhere, there are polystyrene beads everywhere but our Instagram feed looks beautiful! It’s bizarre because it’s so powerful and people’s perception is that there’s been a big change in our company this year and that’s purely down to the right photos being posted at the right time. How many sales does it generate? Nothing to write home about but for brand awareness it’s great. It’s the same for PR coverage. AWD. It’s completely bizarre! Newsletters are important to us though as our customer base is more traditional. I wouldn’t want to send them more than one email a month though. They’d be outraged and they’d be unsubscribing before we knew it! AWD. That sums up our entire database! We obviously get a lot of data capture at events because they sign up for things somewhat reluctantly so you have to be so careful to make sure you keep them! Usually we announce discounts with each newsletter although I did an email last week based more on what we’d been up to in November because we were asked to exhibit at Clarence House (Prince Charles’ London home) at a ‘by invitation only’ event with guests invited by Prince Charles… anyway that was one of the few emails we’d done this year without a call to action about sales and they bought big time! SC.SD. People appreciate hearing about that personal experience behind the scenes though don’t they? Especially in retail; the whole #meetthemaker tag on Instagram did so well! SC.SD. Exactly! “Prince Charles loves it!” Let’s talk low points. Any moment where you’ve wanted to walk away from it? When it comes to the business though you know they have to go because it’s taking its toll on the business and the team. There’s no skirting around that. SC.SD. How do you deal with that then? AWD. Ultimately I think you’ve got to give people a fair chance and a fair warning and you need them to understand what’s happening and why it’s happening. I always give them a chance to improve and then revisit it. I do think that if it’s not working for us though, the chances are that it’s not working for them and my hardest one was someone I really liked personally but ultimately she needed to go. It’s challenged me to be much more direct than I would be in everyday life which has been so tough. SC.SD. It’s a good business skill to learn though. How do you switch off or pick yourself up from those low points? AWD. I’ve always had the ability to just switch off if I need to. An hour of TV a day works wonders. For me, that’s better than a glass of wine each day because I know that would quickly become two glasses of wine! SC.SD. So the minute you walk through the door, is it a case of work stays at the office? AWD. Now that Scarlett’s here, it’s so great because it’s bags down and I give her a hug. The boundaries were mixed when I still worked from home two years ago. That was harder because my pile of work would still be sitting here, Harry would come home and be like “aghhh, why are there boxes everywhere? !” As soon as the TV went on though, that was the end of my working day. SC.SD. It’s so funny because my sister takes the mick out of me for watching The Kardashians but it’s mind numbing and I can just switch off. AWD. I watch Hollyoaks and Harry’s the same! The embarrassing thing is you sort of feel like they’re your friends!! AWD. “My mate Kim!” But I need that switch off! Also come 9o’clock, the phones and laptops go away and we genuinely don’t have any work chat after 9pm because our dialogue can be very work heavy! He knows everything there is to know about this business. He’s a worrier though, I’m not a worrier… I just think we’ll work it out tomorrow and it’ll be ok whereas he won’t sleep until a plan has been made. SC.SD. I’m making this up as I go! AWD. Exactly! It’s problem solving and the more problems you solve the more confident you are to know that when tomorrow’s problem crops up, you’ll solve it. AWD. My family have always been so supportive. I wasn’t walking away from a high powered job though so the stakes weren’t that high for me. I had a tried and proved theory that I was going into so had I not had all of that, perhaps people wouldn’t have been so supportive. Harry’s always been great although he’s often said I could have done anything or nothing and we’d probably be better off than we’ve been at many points when we were spending all our time working on it and not taking any money from it! I think I’ve taken quite a hit in my social life because something has to give. For me though, if you live in the countryside, you can go a few weeks without seeing friends so I like to think I’ve just been living like I would in the countryside but in London where I don’t see people for a few busy weeks/months in the year! I have a small group of friends who understand it, they’re super supportive and they know I can’t see them all the time. My team are an extension of my friends and family too though which is a little bit sad! SC.SD. Not at all! You spend so much time with them! It’s a bit of a reality check because everyone’s got to slightly indulge the boss which is a little bit surreal sometimes! Ultimately though, with all the girls, they’re all people I’d spend time with. SC.SD. I’ve never heard that one but I will definitely remember that! It’s one of my favourites so far! AWD. It really resonates! And if you haven’t read ‘The Power of Now’ I find it so useful and it helps me to remember I’ve chosen this way of life so I should enjoy it. It’s all about living in the now as opposed to constantly thinking ‘I want to be here’. I have to keep reminding myself of that, there are so many things I want to achieve with the business and hopefully I can. There are also plenty of potholes that could open up but I’m actually really enjoying it now. We’re a great team, we’re growing so quickly and we’re all learning so much and the fact that we’re here eight years later is amazing! SC.SD. This goes against what you’ve just said but do you have an end goal? There are so many places I want to take the company that will make it more high profile but we’re in a good place now as we’re making good profit and so I’m finally able to invest that profit. I’m really happy where I am now and that’s something I aim for… to be happy at every stage. SC.SD. Love that! What advice would you give to anyone that’s thinking about setting up their own retail business? AWD. Yes it has a low barrier to entry but make sure it’s right before you commit yourself because it’s seriously tough and to be honest I don’t know if I’d go into retail again! If I had consistent sales throughout the year it would be brilliant but I get nine months of preparation and then three months of hell – it’s so seasonal – and from staff point of view it’s hard. BUT!! Here goes..! Do your research, speak to as many people as you can and be absolutely sure about your product and margins! It is a real privilege to have products that are in people’s homes though and there are many people whose businesses are way more profitable than ours but because we touch people’s homes we’re so well-known compared to so many companies! There’s more kudos to it for that reason but definitely go into it with your eyes open! For more information on Wingfield Digby, visit the website here or find them on Instagram: @wingfielddigby. To listen to a Podcast of Alice’s Story from the January ‘Make It Your Business Event’, simply subscribe to ‘Make It Your Business (membership is free)’ and email us at hello@makeityourbusiness.co.uk to receive the Podcast download.